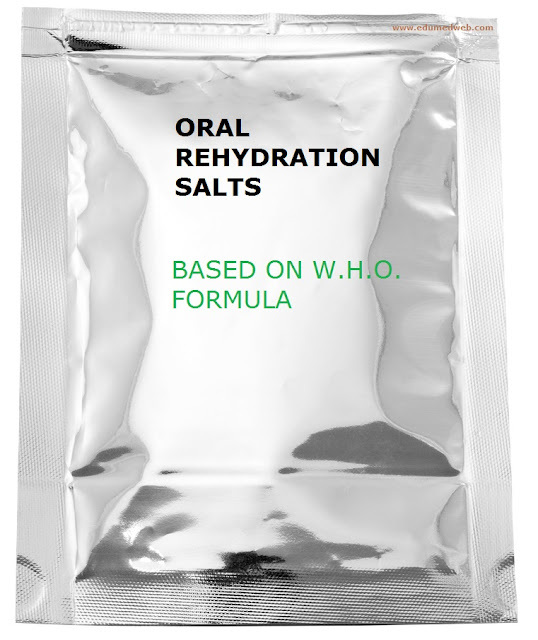 Oral Rehydration Salts (ORS) Is Primarily Indicated To Replace The Fluid And Electrolyte Loss As A Result Of Vomiting And/Or Diarrhoea. Also Used In Fluid Depletion & Rehydration Of Patient With Burns. Electral (Oral Rehydration Salts )-21.8 G Sachet, Electrobion, etc. The Content Of The Packet Is Dissolved In One Litre Of Drinking Water Which Is Already Boiled And Then Cooled, And Should Be Used Within 24 Hours. Approximately, 50 mL/kg Of Body Weight Of ORS Is Given In First 4 Hours In Mild Dehydration And 100 mL/kg Of Body Weight Of ORS Is Given In First 4 Hours In Moderate Dehydration. Severe dehydration needs Intravenous Fluid Therapy. ORS Should Be Discontinued And Fluids Replaced Intravenously When Vomiting Is Protracted Despite Proper Administration Of ORS, Signs Of Dehydration Worsen Despite Giving ORS, The Person Is Unable To Drink Due To A Decreased Level Of Consciousness, Or There Is Evidence Of Intestinal Blockage Or Ileus. ORS Might Also Be Contraindicated In People Who Are In Hemodynamic Shock Due To Impaired Airway Protective Reflexes.